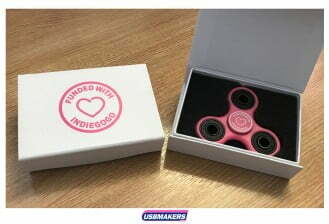 Branded Fidget Spinners are this years must have promotional give away for all ages. These small, addictive toys are perfect for any promotional event or branded giveaway. 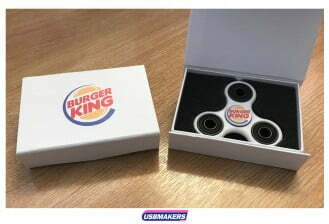 Logo Personalised Fidget Spinners can be used in every environment. From the workplace, schools and even everyday use at home. With Fidget Spinners sweeping the nation, what better opportunity to customise your own. Voted the “Must have toy in 2017” and “Top Tradeshow product of the year”, choosing to have your logo printed onto Fidget Spinners gives you the opportunity to promote your company with a long lasting and memorable impression! We currently stock six colours of Hand Spinners; black, white, red, blue, green and yellow. We offer double sided print of 1 – 4 spot colours with full colour also available! 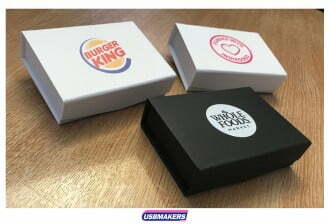 All products will be packed in a generic display box or presentation boxes of your choice which can also be branded with your logo. 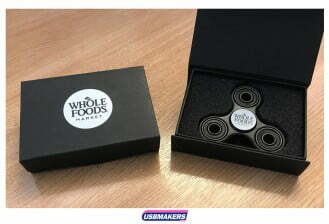 With a range of delivery services we can satisfy any need, whether the Logo Branded Fidget Spinner is needed for months down the line, a couple of weeks, or even for that last minute Panic, we can provide a lead time to help. Our Standard Service offers a lead time of 10 working days, whilst our Express Service can offer a lead time of 3-5 working days and even 24 hours! With a minimum order of only 10 units, these are perfect for any occasion. However, we can also produce up to 100,000 units! Fidget Spinners, originally designed to help relieve stress, concentration and even benefit those with ADHD, Anxiety and Autism, are now a global phenomenon with everybody wanting to get their hands on these small, simple but endlessly fun products. With alloy ball bearings in both the centre and each corner acting as a counter weight, allows the Spinner to move freely for up to 2 minutes! With Demands for Printed Fidget Spinners continuing to surge, customising these will offer endless branding possibilities! Please describe in the box below, USB Colour, Text your may require, Text Colour, Font and any other information that will help us to create the correct USB mock up for you.